Gentoo Forums :: View topic - Integrated Graphics. starx returns no screen. ? Integrated Graphics. starx returns no screen. ? I tried to slim it down. There were open menus for other driver support that I eliminated just in case. Did you merely do "make menuconfig" and not recompile kernel & modules, and then install the new kernel and modules? If so then this is not a valid test. I was thinking I might have to do so. Emerge doesn't recompile the kernel but, then again, the kernel compile process doesn't use the CFLAGS from make.conf so I didn't give you any instructions for the kernel. from the /usr/src/linux directory. After that, the two commands you cited will install the modules and the kernel binary. I don't think you need to recompile everything at this point, so no "emerge -e" for now. I have an appointment. I should be back in about an hour or so. I'll read up more on rebuilding the kernel. I ran 'make' last time too. I remember it prompting me to. Did you find anything in any of that information I sent out, or did that all look normal, aside from the startx error? tells that that library belongs to x11-libs/libXfont. I've been reading into cflags for some time now with little understanding of what changes to make. I know last time this decision cost me a 20 hour recompile. I figured this wouldn't hurt, but better safe than sorry. should provide a list derived from your cpuinfo which may be more extensive and which can be inserted in /etc/portage/make.conf. Your cflags, CFLAGS="-march=native -O2 -pipe" seem right to my untrained eye. sempron 3000 had 32 bit, k7, socket 462 and 64 bit, k8, socket 754 versions; your cpuinfo suggests 64 bit, k8, socket 754 version in which case I believe -march=k8 would be an alternate to -march=native which would allow more optimization than not specifying -march. After make menuconfig, I ran make and rebooted. CPU_FLAGS_X86="3dnow cdnowext mmx mmxext sse sse2"
Should I change -march=native to -march=k8...? I looked them both over thoroughly. Your cpu MHz and bogomips variations are due to the operating frequency of the crystal oscillator controlling your motherboard changing with temperature. [ 85.420] (EE) XKB: Failed to load keymap. Loading default keymap instead. [ 84.264] (II) The server relies on udev to provide the list of input devices. so I was expecting evdev to be used for your input devices. It appears it did not try to load. evdev is in two pieces, A kernel piece and an xorg piece. in the output, the Xorg part of evdev is not installed, so let it run. then in a Rebuild, not New, so you already have it. Its on by default. That means unless you have turned it off. as that tests the running kernel if you have /proc/config.gz the former tests the kernel at /usr/src/linux/, which you may not be running. The fix is to rebuild the kernel. in several stages of change. I did "make menuconfig" to configure the kernel with the configuration on udev on Gentoo wiki. I did the same thing to get the right use flags for xorg/drivers for keyboard configuration. I was hesitant, because I spent so much of my time working on the xf86-video-sis driver to re-emerge. Isn't there something I can do to protect that package, before I proceed? Unless, there's something else you guys have in mind. I made the changes trying to load evdev from the file directly, and commited it out when there was no change. with that setting would that be worth the outcome and possibly even a fix? I wasn't sure if I should try and change it or not. If I can get anyone anymore information with wgetpaste or answer any other questions, please ask. post url's. Could be useful in keeping us in the peanut gallery in touch with your system state. You should be able to emerge xf86-video-sis at will until a new version of xf86-video-sis or xorg-drivers becomes effective. The patch at /etc/portage/patches/x11-drivers/xf86-video-sis-0.10.7 will be applied each time xf86-video-sis-0.10.7 is emerged. I would've got this to you sooner. I kept doing a make menuconfig. I configured 12 different kernels. None would support my wifi adapter, because of the b43/ssb bug. Why that version is stable and the alternative isn't, I'm unsure. It about drove me crazy. I never did have systemd installed. I have openrc. From what I understood when I went through the installation process was you should chose one or another. I'll have to read up more on that. I was swapping back and forth between xorg.conf scripts and auto, and I still couldn't get startx to work. I was slightly altering and playing around with the self-generated scripts and what's on wiki. I can't wait to figure all this out. 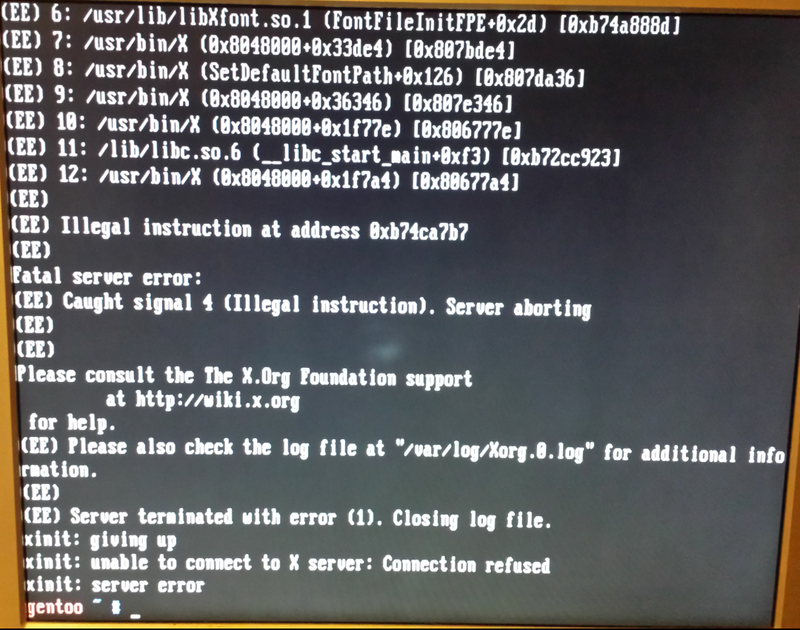 Your latest Xorg.0.log is a must too. I picked up a PNY 3200 DDR 400Mhz 1Gb stick of memory today for $5.30. There was only two slots. Now, this monster has almost 1.5Gb. lol... I think it takes 128Mib of system memory for video. It only registers like 1.38. Monetary issues and garbage equipment aside, I was just investigating the rc-status and init.d of what needs to be running for startx, but that's to get it running from boot, correct? I also was curious... I've been downloading and compiling things I'll need further down the road, like thunar, slim, slim-themes, openbox..., rather than my machine just sitting idle. It's only a few clicks to delete. I figured it was better to give you a complete picture of what's going on. in my latest kernel modification. You are still building, or have built somethung for the wrong CPU. Your CFLAGS from make.conf can be changed by both ebuilds and by the packages provided build system, so it may not be something you are setting. We need to determine the package causing the illegal instruction and fix it. [ 1657.714] (II) UnloadModule: "sis"
Thats a bit disappointing. The sis driver is not installed. However, vesa loaded - it works on any graphics card produced since 1998 and a few before then too. [ 1657.715] (II) Module vesa: vendor="X.Org Foundation"
[ 1658.083] (EE) XKB: Failed to load keymap. Loading default keymap instead. The date, Sun May 17 13:21:36 BST 2015 is the build time of the running kernel. Yours will be different. Does it look right to you? As your .config from /proc/config.gz looks OK, it won't matter - thats your running kernel. The /sbin/udevd --daemon is the important bit. dmesg may tell what was killed by thu illegal instruction exception. If you can find it , rebuild it and try again. Probably not the issue, but I'm compelled to ask. I had him fix his CFLAGS and reccompile everything. @jwm224, have you rebooted since then? There are systemd components showing here. I don't remember building any, and I'm positive it's not checked in the genkernel, just openrc. Though, I'll go check the option, if you think it'll help. I want to go through it again anyway. I learned so much prepping the other kernel and troubleshooting for b43 / ssb catastrophe all of yesterday. I know there're changes to be made here and there. Yeah, I reboot after almost everything I compile or build. Maybe too much. Somewhere over the last day I got lost on where I was with kernel options, lost the point I was at. I'm just about back there now. I noticed that too with the SiS driver.. I saw Xorg.0.log files that had [SiS] listed all through it, and just the same, [vesa]. It seems that either will work, although I don't know the stability factor is with either one. I'm thinking it's kernel verses genkernel, because that's what I had to fall back on. The sis module appears when the running kernel was eselected and emerge xf86-video-sis was run against it. The sis module disappears when a new kernel is booted that has not had emerge xf86-video-sis run against it. Usually the module is persistent as long as the kernel version is unchanged and the changes are minor. Possibly not the case for the kludged sis module. Your dmesg is full of your wifi restarting, so its not useful. The vesa driver is a generic, uses the BIOS on the video card to provide very limited 2D acceleration driver. It will work with almost any video card. The sis driver is designed to take advantage of your video card, so its performace is better. Vesa is maintated to work with the latest Xorg. sis is/was not, hence the patch that DONAHUE found for you. Regardless, we need to find the source of the illegal instruction exception and fix it. From the peanut gallery: It appears from the last couple of Xorg.0.log that the Caught signal 4 Illegal Instruction failure mode has been cleared. My Xorg.0.log has many appearances of evdev and of udev and 10 of XINPUT. jwm224 has 0 evdev, 0 udev, and 1 XINPUT. As Neddy has stated repeatedly there is a udev problem causing an evdev problem. Can you see any way this could be true? Can anyone see how whatever process is trying to compile a keymap could conclude that the root partition is full if it isn't? I read through that same arch forum earlier today. Lots of space in the root.